I woke up today thinking about a lot of things. First of all I woke up thinking about how I have to clean out a broken refrigerator and also around it. That is enough to make me want to procrastinate and think of something else that I’d rather do. But the truth is, I have to do it. It’s one of those things that just has to be done and I’m the only one who can do it. Social media is always a great excuse to procrastinate so here I am. My Pinterest Page that I'll talk about more here. The other thing I thought about writing about is my recent deeper foray into social media. I’ve always blogged on here for fun. I’ve never done a lot to promote my blog or to sell advertising on this space. In other words, I’ve never made a business of this. I’ve also never really written about shoes, even though I do love shoes and that is the title. I’m more of a lifestyle blogger that blogs about being a mom, working and the many adventures I’ve had over these 11 years since I started this blog. I blog a lot about education and the Magnet School program in the Houston Independent School District a lot. In the last three years since I’ve been divorced I blog about co-parenting. As a native Houstonian that loves her city, I blog about Houston, and here lately about caring for my elderly dad. I have a project I’m working on with my dad called Dicho a Day. We record these videos where he says a dicho in Spanish and then I give it its best Spanish translation. Those can be found on my YouTube channel. I also started writing about caring for my dad on Latina Lista in a column called Padre Care. I finally decided to change my social media descriptions on all my profiles with one uniform theme. So if you go here on my blog, to my Twitter, Facebook, Instagram, Google +, YouTube and Pinterest you see six main hashtags. 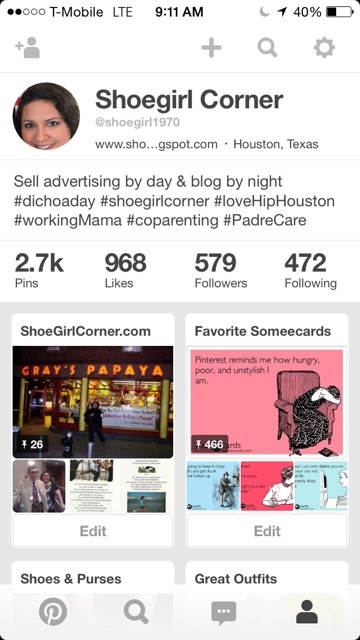 #shoegirlcorner, #dichoaday, #loveHipHouston, #workingMama, #coparenting and most recently, #PadreCare in my profile description. These are my six main themes on social media, whether it’s me posting a photo of the Houston skyline on Instagram or directing people over to something about my dad. Here recently I’ve learned a couple of new things. One is that my Pinterest page gets a lot more traffic than any of my other social media channels. Like a crazy amount of page views for just a regular me. The board that gets the most action is my Someecards board. Coincidentally, or not, that’s another one of my obsessions. I love writing and making Someecards under the User Cards. I’ve created a bunch on their site and then I pin them over to my board. I have a few of my own creations that have been re-pinned quite a few times. As well as some of the ones created by others that I just share. It turns out a lot of people have my same my wacky sense of humor. So my new idea is to try and leverage some of that Pinterest traffic over to my other channels and especially to my blog. My poor little blog that has been getting the least attention from me lately. This is the same blog that has its own URL, www.shoegirlcorner.com but that I haven’t done anything with that. My designer friend has given me three layouts to choose from and I still need to get back to him on which design I prefer so he can help me launch my blog on my own platform. Another social media channel that I recently joined and that I really need to learn more about it Periscope. It’s owned by Twitter, it allows you to video live and the video goes down after 24 hours. 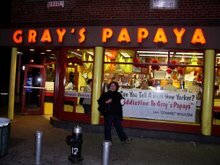 I really tried it for the first time last night with Dicho a Day. I learn so much about social media from the Blog Elevated group. This is a group of fantastic women who have so much information to share and they will be hosting their third conference this year. It’s lead by Lisa Stauber and Bobbie Byrd. I’ve participated in their Twitter chat on Tuesday evenings and I’m trying to do it more consistently so I can learn even more. The more I learn the better I will hopefully get at promoting all my writing and creative efforts. That is my goal! 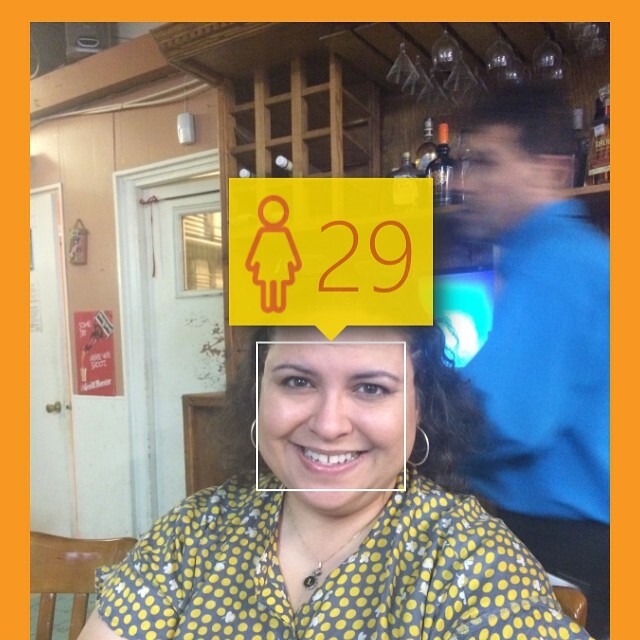 So Rey has this crazy app on his phone that can scan your face and it gives you an approximate age. I loved what it had to say about me. Thus the reason why I say I'll be 29 forever. Just kidding, I'm not going to be on of those women who does THAT. I will be proud of my 45 years and tell everyone so they can tell me I look 30. Win-win! The kids are well into the summer. Miranda is loving the Kinkaid program and I love that she loves it. We are so lucky to have such a wonderful program for public school students. This year she's taking electricity, robotics, drafting, biology, marine science and math. The boy is hanging out with his best friend this summer until his sister finished with summer school. He has a summer reading list that we still have to tackle. The main book is the Malala book. In other mundane news, my refrigerator died. I came home Thursday night from an event and it had just died at some point that day. It was totally defrosted and dead. Now I have to buy a new refrigerator. An expense I did not need but life is like that sometimes, just trying to teach us more and more lessons, like I need any more. Thanks Life! I'm good! If you want to see what else I've been up to check out my PadreCare column on Latina Lista and I'm revamping my Pinterest page to cross-promote my projects more. Next up will be that review of Gwen's new book of poetry. Check out my second post! What Is It About Nike Quotes? I'm Just Going to Rename My Blog "Nike Quotes"
Every Princess Deserves a Tea Party!